Fiber Flux: Free Crochet Pattern...Butternut Squash Neck Warmer! Free Crochet Pattern...Butternut Squash Neck Warmer! 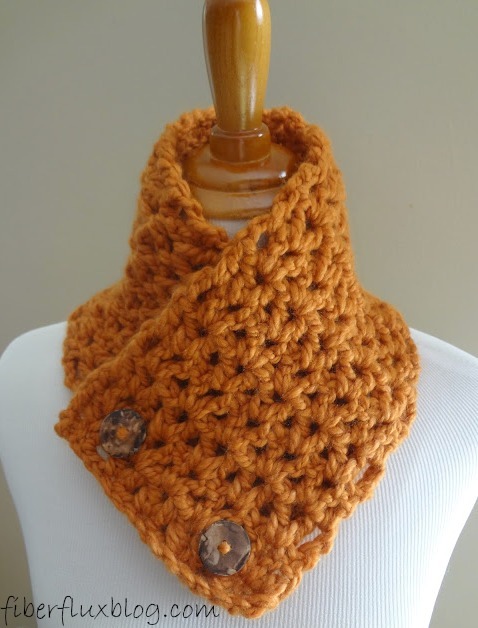 Just as the first hints of fall are in the air, here is the Butternut Squash Neck Warmer! Crocheted with a simple but beautiful stitch sequence, this is a fabulous and lighting fast project that you can have finished before the first autumn leaf falls from the tree. Make one for yourself and several for others as we approach gift making season! 2 Buttons (Note: this neckwarmer does not have button holes, it uses the lacy holes in the garment as button holes. 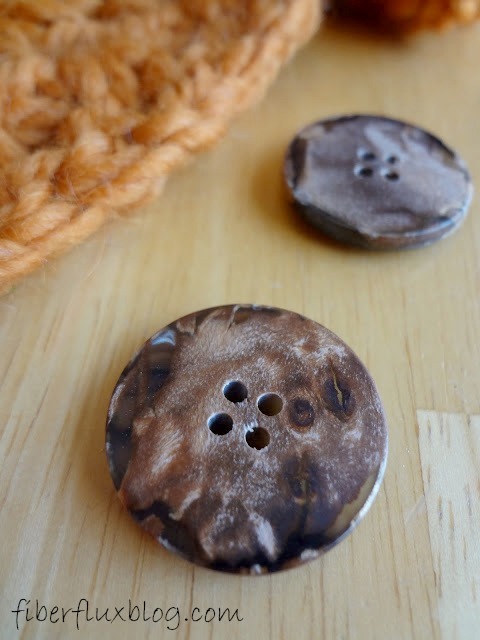 When selecting your buttons be sure they will comfortably fit through the holes before sewing them on. Length-the neckwarmer pictured is 26 inches long. If you need yours to be a bit longer, just work extra rows as needed until desired length is reached. Foundation Row: In the 4th chain from the hook, work dc, ch 1, dc in the same ch. *Skip two chains and work dc, ch 1, dc in the same ch. Repeat from * to end, then in the last ch, work 1 dc, ch 1, 1 dc in the same ch. Repeat row 1 until neck warmer is desired length. Yay! They sure are lucky to have someone making them crocheted things! I just finished the fiona button scarf 4 my grand daughter in law who just had a neck operation & I hope she enjoys the scarf. I purchased the color that was in the picture & it was a beauty when finished. My next scarf is going to be the butternut 1 & my grand daughter in law is a blond so it should be marvelous on her. Thanks 4 such wonderful patterns. I also make hats 4 newborns & take them 2 hospitals & also hats for chemo patients. THANK YOU!! I was looking for a very sinple project to begin crocheting again. This is perfect. Thank you for your gift of this free pattern. Yay! So glad you like it...happy crocheting to you! Will definitely try to make it! Thank yo so much! :) Have fun! beautiful neck warmer and I love the color, I totally plan on making a few... what size are the buttons you used? Thank you. It does help. What is the actual name of the color you used, I really do love it and want to make a bunch for a group that I am part of. I made one like this as a gift to a friend. Thank you for sharing the pattern. Very easy to follow, it didn't take me long to finish. I would love to make another one soon! Great, I am so glad you enjoyed the pattern, I love this too for gifts! Hi, I'm new to goggle's blog, so im not sure how to follow you, but either way, I like this neck warmer is cute!!! Thank you for sharing this great pattern! I have been looking for a small project to expand my crochet skills and to have something to do while waiting in the car at school pickups, etc. I drive a school bus and load/unload wheelchairs. I can't wear scarfs as they get in the way when I bend down to secure/unsecure the chairs. I've been looking for a pattern that would keep my neck warm and not hang down and I think this will work perfectly!! I am excited to try this! Thank you for sharing your talent and creativity!! Awesome, glad you like it! Thanks for your kind comment! Thank you so much for your sweet words! You made my day! Happy crocheting to you!! Thank you so much for the pattern! I've made 2 of these and 3 of the fiona scarf/cowl for christmas presents thus far. I'm at the finding buttons phase ...Where did you get your buttons? Any place special? What is the manufacturer/style #? I tried to bring my project to the store to match up, but I don't have a good eye at all! You are so welcome! I got mine (the ones shown above) at the local fabric store, they have so many it is overwhelming! I also love getting buttons from Knit Picks. Another great place to hunt for buttons is antique stores! I got a few Victorian ones last summer that I treasure. Plus when you give something with an antique button, it is something neat to tell your recipient! Thanks for the pattern! I've tried it a few times but I'm having a little trouble with the beginning. In the foundation row after working the dc and chaining 1, dc'ing in the same chain is where I'm getting confused..
You're welcome! All that means is that you do the double crochet, then the chain 1, then another double crochet...but all in one chain. That will give you that "V" shape...hope that helps! This was great! Thank you. I made one for my mother-in-law for Christmas. You're welcome, she is lucky to get a handmade lovely from you! I just made this. It is wider than the 6 1/2 inches but it turned out beautiful. I used a size k crochet hook. I used the same yarn that it called for and I just had enough. Thanks for posting this pattern. I can't wait to wear it tomorrow, I'm sure it will keep me warm. Glad you like it! Happy wearing! Yes, they are! I got them from a local fabric store, JoAnn Fabrics I believe. When I bought them I got these and a very similar looking set, I can't tell now which was which by looking at the picture! Anyhow, one set was made from recycled plastic and the other set was made from coconut wood. If memory serves me correctly though, I think these were the recycled plastic ones. For row 1 you want to do a dc, ch 1, dc in each of the spaces made from the v shapes in the previous row. That way the v's will have a stacked appearance. Make sure too you are working in the spaces and not the stitches too. I hope that helps! When I do row 1 with a dc, ch1, dc in each space, it gets wider. I've tried it a number of times and cant seem to get it right. Any suggestions? Thanks! Yes! In row 1, be sure in the last space to do only 1 dc, and not the dc, ch1, dc. If you do that in the last space it will increase and make a triangle instead of a rectangle. Hi Jennifer, Thanks for this pattern... I recently made this pattern for my personal use and its really quick and simple to follow it. Do visit my blog in coming weeks to see my project. Hoorray! So glad you like it! I would most definitely love to see it, Let me know when it is up! Jennifer, you have instructed me on my first project! I've made two wraps in two days. Your instructions are wonderful! I'm truly grateful and inspired. Thanks so much! Wonderful! Congratulations on your first project and thank you for your kind comment! I love your pretty patterns! Thank you so much! I crochet to help me through chemotherapy, and I really appreciate all the hard work you have put into your patterns. How to you keep the cowl from curling up while crocheting?! Thanks for your question! Sometimes when I get a bit of a curl, I'll stop working for a minute and give it a gentle tug to straighten all of those stitches out. If it curling badly, check your tension. Often if everything is too tight, it has the tendency to curl somewhat. Hope that helps, happy crocheting! Thanks Patience! I especially like the v-stitch, it is so easy, but interesting at the same time! This is a beautiful stitch as is the pattern. I'm new to crochet but was able to make this scarf. As for the buttons...it appears that you sewed them on with yarn. Did you attach them and knot them behind the button? Hi I'm new to crocheting. I understand how to do the basic dc but not the additional ch 1, dc in the same ch. *Skip two chains and work dc, ch 1, dc in the same ch." Do you have any photos or videos you recommend on how to do this? I've searched, and cannot find any. Thank you!! I made this one a few months ago, using Home Spun Yarn. I've worn it a couple times since and I love it! Easy (and quick) to make and I've gotten lots of compliments on it. Just made this tonight, super quick and beautiful! Hope my SIL likes it for Christmas! Made a bunch of these for Christmas presents! Quick to work up, and so pretty! i made the neck warmer in a pretty varigated wool. It turned out well! Waned to show you a picture. Its blues, greens, gold, purple. The buttons are wooden blue green. Thank you for the lovely, quick pattern. I had not done any crochet in years. It was perfect to get started again. I used what I had on my shelf, so it is white with three buttons. The top one is a large purple flower the next one is a smaller round gray one and the bottom is smallest and is bright orange. They match the stripes on a sweater I have. I started it after work today and will wear it tomorrow. That is the kind of project I like. Thank you for sharing this pattern. I made one this weekend using Lion Brand Nature's Choice Organic Cotton yarn in a color called Spice, and it came out great. I used a smaller hook (J-6.5 mm) but the finished dimensions are similar. Fits great and I look forward to enjoying it as the cooler weather sets in. Just finished mine but I chose a wine color instead. Looks beautiful! Thank you so much for this pattern. I was in a time crunch and needed to make a quick gift. I'm a slow crocheter but this really was simple and quick to make and it looks beautiful! I'll be making more! Thank you! Thank you for this pattern. This is first scarf I made using double crochet, and it was quick (3 hours, but I'm a beginner) and easy. Its absolutely beautiful and I can't wait to wear it.